With the beauty industry revolving around great looks, the design of your business card becomes vital to successful marketing. Whether you are a cosmetologist, makeup artist or massage therapist, you keep building clientele throughout the whole career. 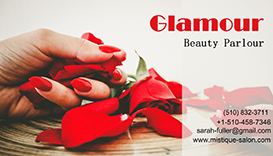 Making easy-to-read beautician business cards that inform your customers on how to get in touch with you is like hiring a sales manager who works 24/7 to promote your services. That is why you should take time to think over the concept of your card and then fully realize it. If you want all your marketing efforts to end in success and bring new clients into your chair, you certainly cannot do without a proper business card. However, creating one can be quite challenging as you should follow certain rules. Check out these simple steps, and learn how to win customer loyalty with a stylish business card! 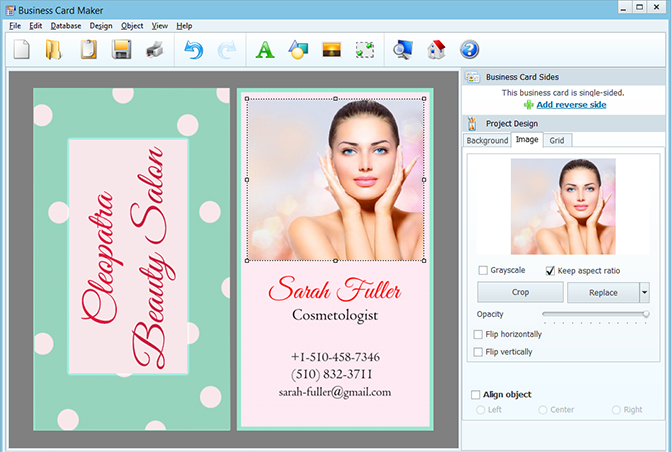 An obvious and easy way will be to find a professional designer and ask them to make a card for you, or you can simply use ready-made salon cards. Those who want to build a rewarding career, though, will make sure that they own a one-of-a-kind card reflecting the specialty. In this case creating your own design with a business card design program seems more than appropriate. 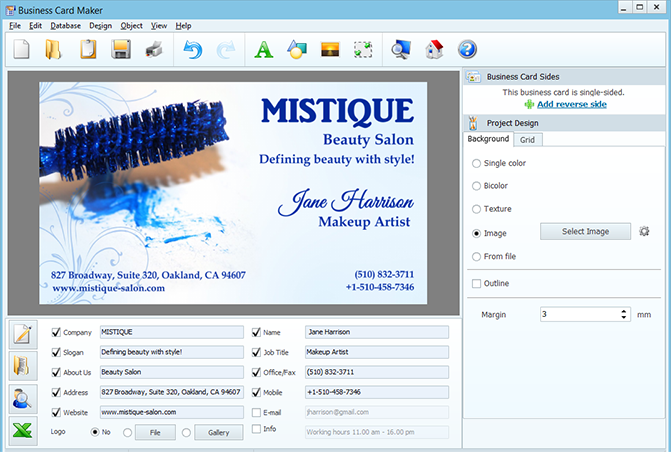 Business Card Maker software has everything you may need – from a vast gallery of card templates to numerous editing tools. It is not an easy task to make your business card from scratch especially if you have never done it before. 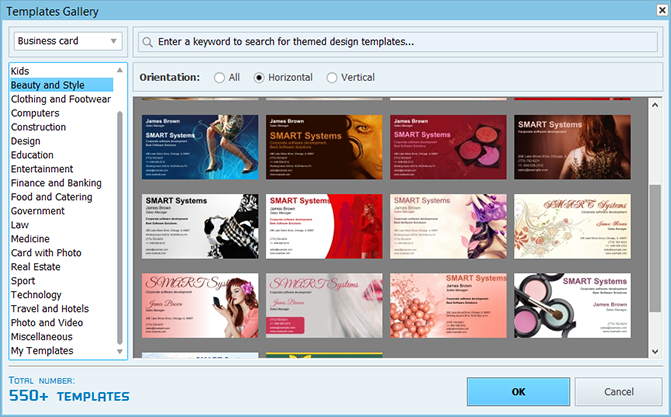 The good news is Business Card Maker software offers you a built-in gallery of card templates broken down into themed categories. 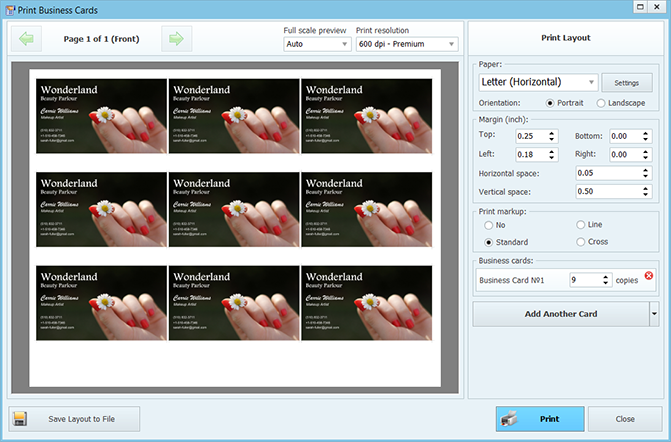 After picking the card design you like, you can customize it by changing the background, playing with the fonts or adding the reverse side. You can also look through the templates collection to put together the image of your own ideal card. When customers get beautician business cards in their hands, they expect to see exquisite designs that show your refined taste. In order to leave a good impression you should be mindful of colors. A speckled card would look gaudy and rather unprofessional. It is better to stay away from trendy visuals, shadows or color gradients, and use two colors at most. If you have decided to include some shapes and forms into your design, keep in mind that they should be clear and easily understood at a glance. WIt is very important to put some real thought into your design and choose the contact information you want to give. Consider your salon name, logo, and tagline as one package, and make sure to make them noticeable. Remember that a good tagline points out the benefits of what you do and add a touch of personality. Add the street address, city and state to map the path to your door. If you have both a landline and a cell phone, you can mention both to be contacted either way. Do not forget about the area code, and use periods or spaces to separate numbers and make it easier to read. The back of beautician business cards is often used to write down some notes and information about further appointments. You can be more creative, though, and make the reverse side a part of the overall card design. For example, put the name of the salon you are working in or its website address on the back to draw the customer’s attention to this information. Which format you choose is a matter of preference, but be consistent to get a neat card in the end. Once you have created a proper design that indicates the services you provide, use your beautician business cards from “behind the chair” to give this reminder to each of your customer. It is also a good idea to hand them a couple of extras to pass along to friends. With the help of business cards you can fully enjoy networking and client retention!